A new bee species found in horse dung in Patagonia, making ceviche to save coral reefs, and training locals in conservation in Bolivia. A newly discovered bee in Patagonia is the first bee known to nest in dung. Found in horse dung on the Patagonian steppe, the Trichothurgus bolithophilus bees are a primitive species that “live a solitary existence in their dung palaces,” according to the New Scientist. Argentine scientist Laura Sarzetti, who discovered the bee species, thinks that dung wasn’t always their home. Sarzetti explains that the bee has probably nested elsewhere during its evolutionary history, since horse dung is scarce in Patagonia and horses were only recently introduced to Patagonia by Spanish settlers. A poor 2012 grape harvest will mean a 24% fall in wine output from Argentina, says the International Organization for Vine and Wine. A Colombian chef wants to use the invasive lionfish for ceviche. Credit: Javier Moreno Serrano via Flickr. Brazil leads Latin America in biopharmaceutical research, says a new report from consulting firm Charles Rivers Associates. The study pitted Brazil against China, Colombia, South Korea, India, Malaysia, Russia and South Africa. Brazil and China lead in clinical studies. Between 2000 and 2010, Brazil has seen three digit growth in scientific study publications. Biologist Erika Cuellar is recruiting locals in Bolivia, Paraguay and Argentina to become parabiologists, members of local communities trained in conservation efforts to protect biodiversity in their countries. Cuellar is working with the remaining populations of camel-like guanacos in Kaa-Iya national park in Bolivia and the unique Gran Chaco region that spreads across Argentina, Paraguay and Bolivia. She’s seen success in her work: locals trained as parabiologists have been influential to indigenous communities. Cuellar wants to involve these same people in policy to further the conservation of the Gran Chaco. A Colombian chef has proposed using the lionfish, an invasive species in the Caribbean, as the main ingredient of a ceviche to save his country’s coral reefs. 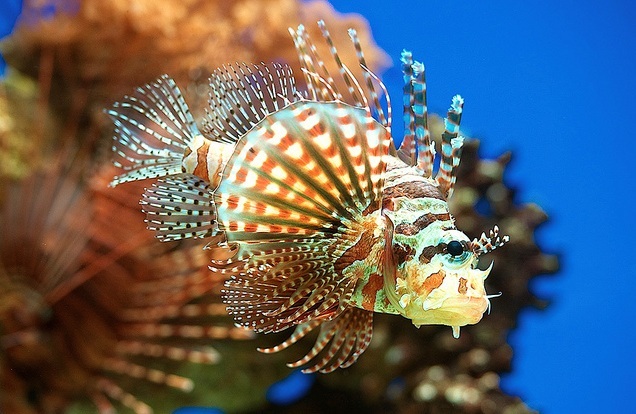 The spiny venomous lionfish is a voracious eater that preys on juvenile fish and crustaceans. These eating habits have had a profound effect on the reef ecosystems of Colombia and the Caribbean as a whole. Chef Jorge Rausch wants to use the meat of the invasive lionfish for ceviche to control the fish’s numbers–a move that he calls ecological gastronomy. Scientists in Mexico are looking for natural alternatives to pesticides to control insects in agriculture. The Universidad Autonoma Metropolitana’s Octavio Loera Corral explains that he is looking at fungi that naturally attack insects and characterizing their enzymes to see if they can be applied to agriculture.